From pepperoni-topped slices to vegan rounds, we've got you covered. From chewy Neapolitan pizza to New Haven-inspired clam-topped slices, decent gluten-free bases and inventive vegan toppings, Sydney's pizza stores cover all the variations. Here are our ten favourites that keep us coming back for their stretchy buffalo mozzarella, pillowy bases and perfect toppings. 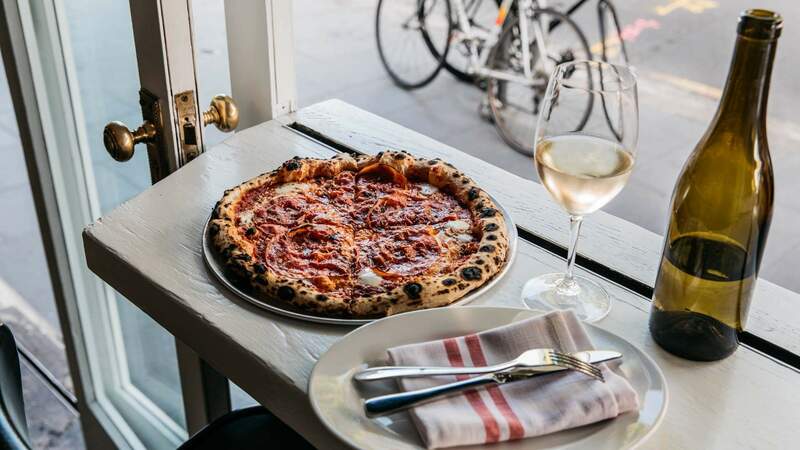 The team behind famed Newtown burger joint Mary’s — Jake Smyth and Kenny Graham — opened Mary’s Pizzeria within their Chippendale live music haunt, The Lansdowne Hotel. The mini-venue takes up an intimate 12-seat dining space, with room for a few extra perched by the kitchen, dishing up the sort of pizza that’s destined to become your latest and greatest guilty pleasure. Matched, of course, with some natural wines or local craft brews. Here, the guys, along with Mary’s Executive Chef Jimmy Garside, are riffing off their two favourite pizza styles: the New York slice and Detroit’s square pizzas. They’re rocking cheesy crusts and cheeky names, crafted with top-notch Aussie and Italian ingredients on 72-hour fermented dough. Expect the likes of the Hot Hot Heat, with ‘nduja, buffalo mozzarella and Sicilian olives, or the square-style Smokey F***er, loaded with rosemary, smoked potato, roast garlic and a whole lotta cheese. Housed in a former cannery, Da Mario inhabits a large and open space — possibly selected to house the big red oven. Toppings are minimal yet deliciously paramount. Take, for example, the gorgonzola con radicchio ($21.50) or the full-flavoured Calabrese with salame, mozzarella and olives ($23). Traditionalists will love the margherita, while calzone fans should opt for the Salame — oozing with soft ricotta, melted mozzarella and black pepper. It’s all stupidly delicious. 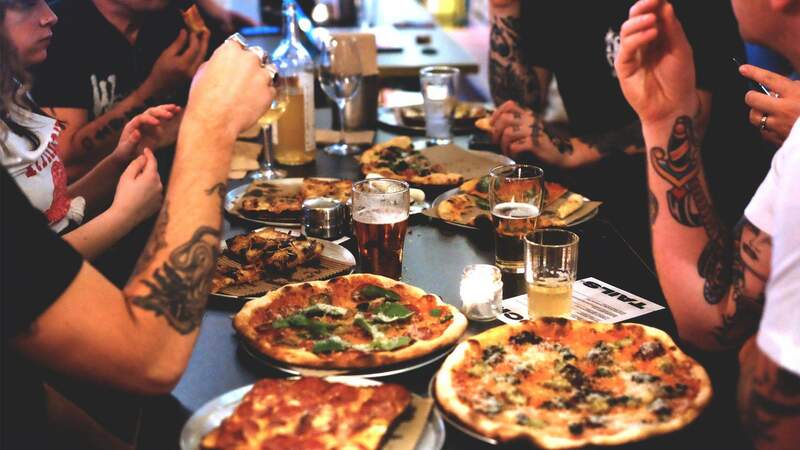 In mid-2018, Bondi Beach Public Bar played host to renowned Philadelphia pizza joint Pizzeria Beddia for one week in its only Aussie pop-up. But, since it departed, the space it occupied at the back of the Campbell Parade restaurant sat empty — so owner Maurice Terzini decided to fill it with a worthy substitute: more pizza. The space is now home to Aussie-accented enotecca named Bonnie’s Wine & Food. It features just four or five winemakers at any one time, and changes up regularly. To match, Group Head Chef Monty Koludrovic has pulled together a lineup of modern Italian-inspired bites his menus at The Dolphin and Icebergs are known for. Walk off the sand and into a feast of Calabrese meatballs, fried calamari and sardines with salsa verde. The main drawcard are three varieties of fried pizza — which are small enough to be a personal snack, and are best matched to a bottle of something fun and local. For a touch of nostalgia, it’s all served on classic silver plates. 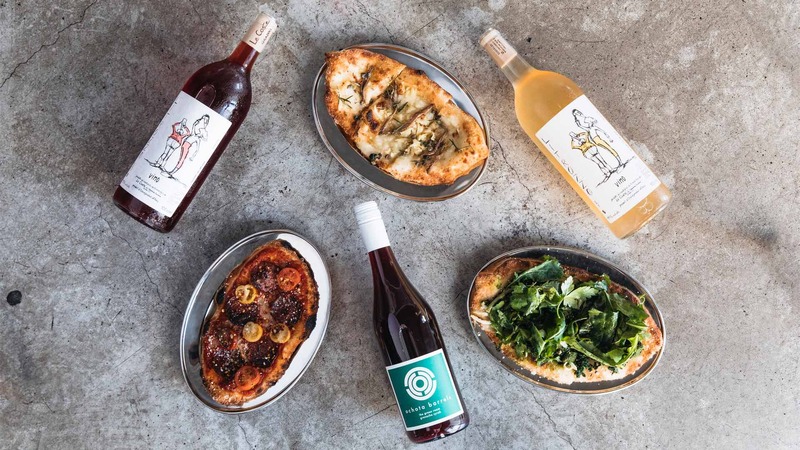 The snug 35-seat eatery, is immediately inviting, radiating a pastel pink glow that spills out onto the corner of Marrickville’s busy Victoria Road. 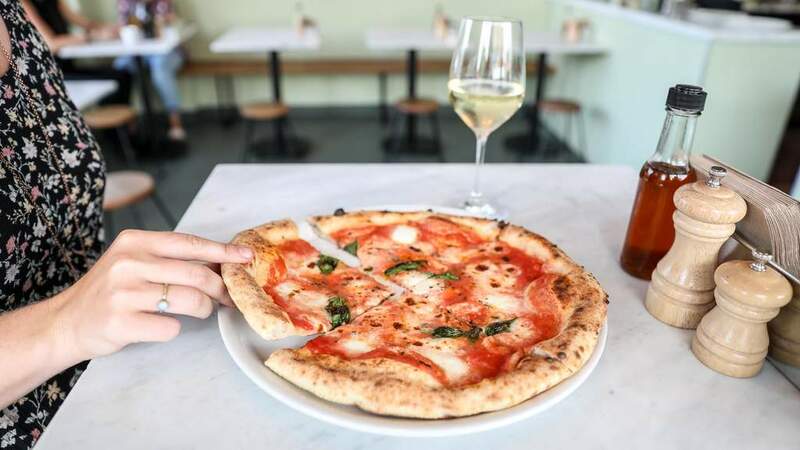 Pizza Madre is brought to you by the culinary legends behind cafe and pasta mecca, Two Chaps, and is similarly characterised by effortless simplicity — a handful of dishes done to perfection. Sourced by produce king Shane Roberts, the vegetarian ingredients are seasonal and exceptionally fresh. The food menu is equally as concise. Each week, there are five or six pizzas on offer, which are shuffled, altered and revised based on the availability of local produce. So if you’ve got a hankering for sampling a different pizza every week for a year, then this is the place for you. Anthony Severino (head pizzaiolo) spent the last few months perfecting his own dough recipe and, as with the truck, his pizzas pay homage to the Neapolitan classic while being noticeably lighter, crispier and topped with non-traditional ingredients — there’s the lobster ($26), topped with black truffle pate, oyster mushroom and sea salt, or the lasagne ($18), topped with ricotta, beef and pork ragu. Traditional pies also make the cut, like the margherita ($15) and diavola ($18), while their ever-popular (though blasphemous to Italians) speck and pineapple ($17) stands loud and proud. We’re accustomed to the idea that every slice of pizza worth its weight in Teenage Mutant Ninja Turtles requires decent lashings of mozzarella. Which is why the news that famed Newtown pizzeria Gigi might be a bit of a shock to Sydney pizza fans. 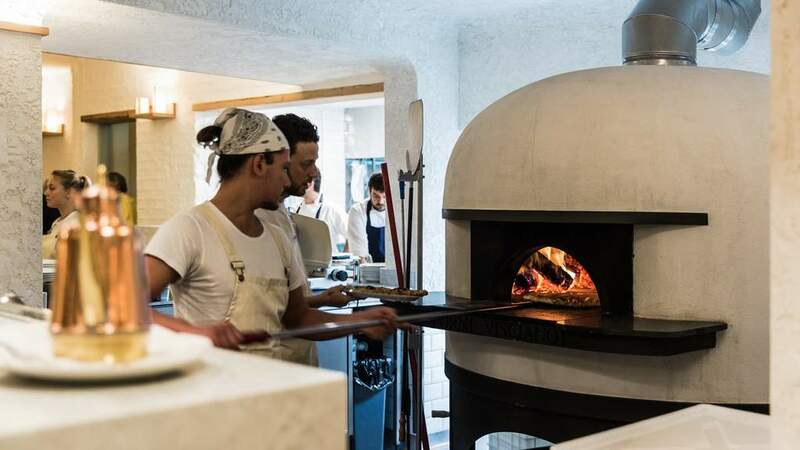 According to owner Marco Matino, the tradition of the Neapolitan woodfired pizza “is an art form which will always be relevant no matter how times change”. 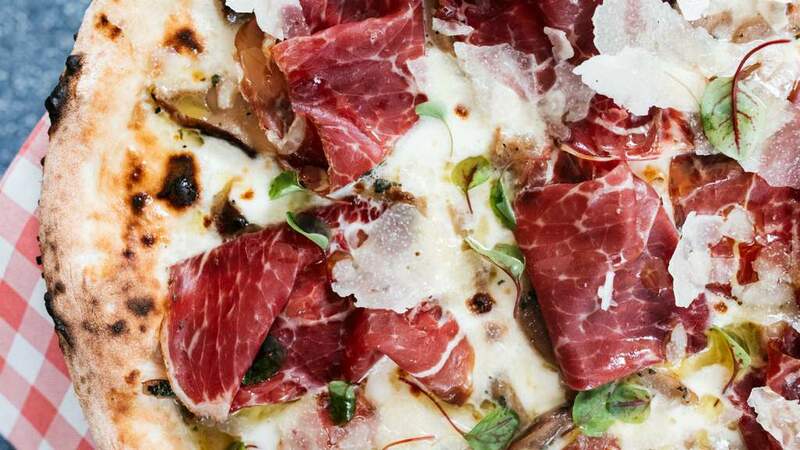 That said, they’ve decided to kick their double smoked ham and stringy mozzarella to the curb in favour of a new plant-based menu that is both sustainable and ethical, with fresh, locally grown produce and key ingredients imported from Italy. As it turns out, Luke Powell of LP’s Quality Meats had a long-held dream of opening his own pizzeria. Mates Joseph Valore and Elvis Abrahanowicz over at Porteño had similar fancies. 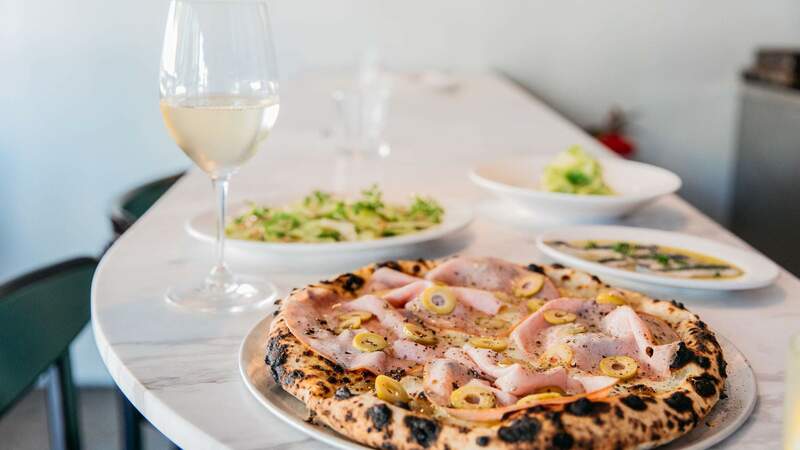 It just took a recent trip to the USA to seal the deal, and now Sydney’s welcomed the group’s first joint venture, Bella Brutta. 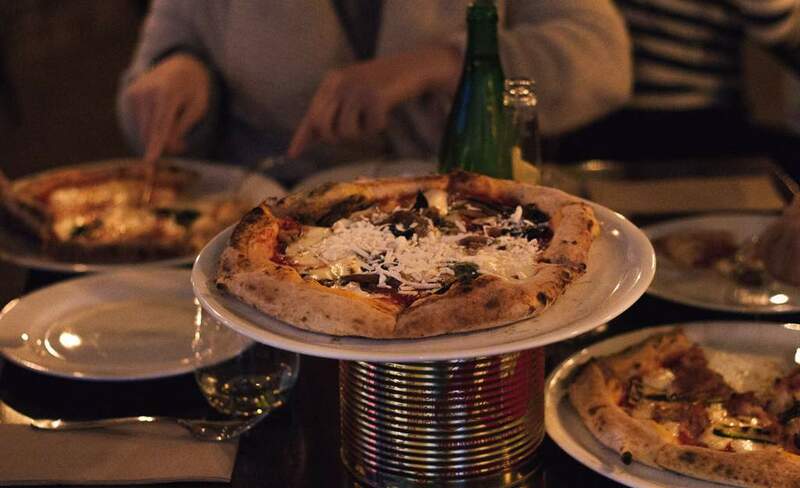 The style of pizza served up here isn’t traditional. 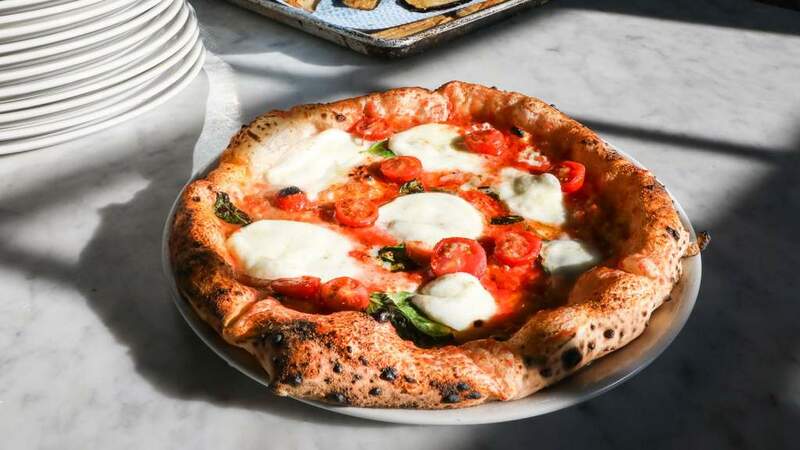 The bases are a mix between Neapolitan and Roman style — blistered and chewy like the former, but crisp enough that it can be eaten with your hands (like the latter) — and toppings vary widely, taking their inspiration from America and across Italy (and even around the corner in Chippendale). If you’ve been to LP’s in Chippendale you’ve probably tried its house-made mortadella. And, here, you’ll find it atop a pizza ($25) with garlic and green olives. The Clam ($26) pizza, however, takes its inspiration from a bit further away — New Haven, Connecticut, to be exact. This white-based pizza is heavy on the chilli and garlic, and unlike anything else we’ve tried in Aus. If you could picture the kind of restaurant you’d like in your neighbourhood, you’d probably picture Matteo. Opening in the old Limoncello digs in Double Bay, Matteo is the labour of chef Orazio D’Elia (Da Orazio Pizza and Porchetta). And the real hero of the restaurant is the matte white cladded woodfired pizza oven with the most beautiful pale mint panelling encasing it. 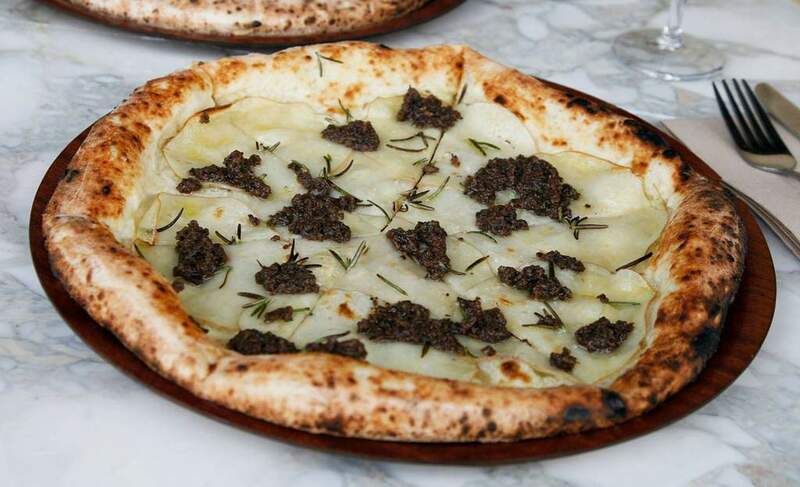 Fans of D’Elia will recognise the pizza formula here: a charred, soft base and sparse, quality ingredients. The funghi option ($24) with fior di latte, stracchino cheese, forest mushrooms and pork sausages manages to be big on flavour without being too rich. The veal rib eye too ($35), which is served simply with some lemon can have the tendency to be tough, but the meat remains tender even with the crunchy deep brown crumb casing. If you’re in the city, you can try D’Elia’s pizzas at the newly opened Matteo Downtown, too. Maybe Frank’s menu features 20 different pizzas, and you can try them all on Tuesday for $20, when they hold their aforementioned all-you-can-eat pizza night — that is, if Pizza Hut hasn’t already ruined that concept for you. Waiters come around throughout the evening and offer around plates filled with freshly baked slices of Diavola (hot salami, capsicum and fior di latte), Gamberi E Menta (prawns, zucchini, cherry tomatoes and mint) and and an Italian take on a meat lovers: Frutti Di Porko. The quality of a good pizza lies predominantly in its base — and the bases at Rosso Antico are super legit. They have that prefect crispy, chewy balance only true Italians seem to be able to produce, and the toppings that amply adorn those base are on point. We particularly enjoyed the Norma ($19), with generous caramelised slivers of roasted eggplant, tangy sauce, islands of salted ricotta and a generous amount of fior di latte. The Zucchini ($20) — with crispy pancetta, roasted zucchini strips and melted fior di latte and scamorza — was equally cheesy. Top image: Bella Brutta, Kitti Smallbone.